Arrange the animals and flashcards on the table so the child can see them easily. Warm-up: Show the child the 3D animals and make sure the child is familiar with the animal and its name. Then, repeat the same with the animal flashcards. Have the child choose 2 animals that are his/her favorite. Let the child know that you will be telling a story about the 2 animals together. The child can use the animal figurine to act out the story. Feel free to help/prompt as little or as much as developmentally necessary. For a more difficult version of the exercise, see if the child can tell a story using more than 2 animals. For a child who finds a complete story too difficult, you can tell the entire story using the animals, and ask the child just to recall the story. On blank flashcards, either you or the child can draw very simple sketches to illustrate the verbal story. 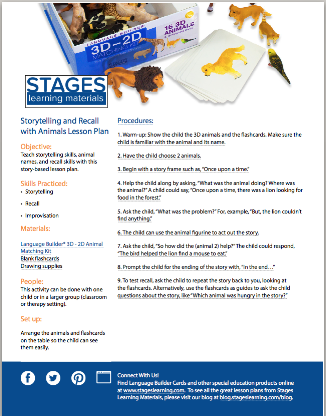 During the recall activity, ask the child to use the flashcards to help recall the story.